Hornbeam Nights, News, News from the kitchen! We are so excited to announce that the amazing vegan Indian-inspired SpiceBox who started their month-long Test Kitchen at our Hornbeam Cafe on Fri 21 Sept have been so popular they are staying to end of December 2018! So if you haven’t managed to have your tastebuds startled yet, don’t worry and hurry on down! Dishes including curry house faves tikka masala, dhansak and korma, plus doffles (dosa waffles!) for brunch at the weekends! Events, Hornbeam Nights, Local Community Events, News, News from the kitchen! Sun 22 April – Help us Celebrate! Sun 22 April, 4-8pm (note later start time than previously advertised). Join Walthamstow’s first fully vegan cafe and celebrate good food and good people. Meet the new chefs. Eat the food. Find out the amazing things the Hornbeam does. Family Friendly drop-in. 4-8pm. Open Decks at the Hornbeam: Bring your tunes, spin your tunes. You can also bring along some vinyl and spin some tunes with Patrick Steele leading Open Decks. It doesn’t matter if you’ve never DJed – now’s your chance to take control of the music! We’ll also be showing the Hornbeam JoyRiders / Cycle Sisters short film and sharing info about all the exciting things going on at the Hornbeam and Learning Lodge generally, as well as keeping you fed with scrumptious tasters. Organic hot and cold drinks and bar available. Spread the word! All welcome. Do you want more confident, high quality local businesses? Help us build this project – just a few pounds investment will bring lasting long term rewards for the community! Hornbeam Nights, Local Community Events, News, News from the kitchen! The Hornbeam Cafe and Centre has been running as a vegetarian cafe and community hub for 30 years. This month we have become the first fully vegan cafe in Walthamstow serving 100 per cent plant-based food and drinks (we will no longer serve dairy milk or eggs with brunch). We are delighted to welcome our new kitchen team – Kitchen Manager Frankie and a new chef, who both have amazing culinary credentials plus huge enthusiasm to make people’s experience at the cafe better than ever. Frankie grew up on an organic veg farm in Devon, which his parents still run, with a shop and a box scheme – so the Hornbeam is home-from-home for him. “I started my catering career when I was 17. I worked in a restaurant based on an organic farm so all the produce we used in the kitchen came straight from the farm. “From there I have worked in all manner of restaurants, but I am now glad to be back to my roots at a small independent business that supports local businesses just as my mum and dad still do today. “We are excited to be working with such beautiful seasonal produce provided by Waltham Forest’s own organic cooperative – Organiclea. We have updated our menu with the same regular favourites such as the daily curry and salad and vegan quiche and we have now rolled out the weekend brunch all week. Hornbeam’s famous vegan sausage brunch is now available all week. Free drink with any cake during November! The Hornbeam Cafe supports the local community and uses local suppliers such as Organiclea for all our veg. We have a fine selection of alcoholic drinks from local breweries including the Wild Card brewery in Walthamstow. Plus organic and locally produced soft drinks such as Kombucha (come and learn how to make it at their Kombucha workshop in November). We also sell Perky Blenders ethically-sourced coffee roasted in Leyton. The Hornbeam also has a fair-trade policy so that a fair price can be paid to producers, suppliers and staff. If you are interested in running a workshop on your own environmental or social change workshop or pop up supper club get in touch. Are you a local artist? We are supporting and exhibiting local artists work in the cafe every month. Would like to have your own exhibition? Please visit our website and Facebook page for a full list of events. Please support our Social Adventure! We have launched a Spacehive crowdfunding campaign for the Hornbeam Centre and Hornbeam Nights and would love your help! We want to continue creating our Hornbeam Nights evening workshops, supper clubs and music events to support our amazing community but need to update our equipment that has, well…. seen better days! As Charlie who organises our events says: “We want to provide an ethical and sustainable space for creatives, where aspiring musicians, DJs, workshop facilitators, small businesses and chefs, can walk into and feel held and supported not only by just but by decent gear and equipment. The Hornbeam is a community anchor, providing space to groups, support and incubation of new ideas, and a point of entry for people wanting to take action. We support people lacking in confidence and skills to set up new social enterprises and community initiatives. For example the cafe and kitchen space is currently being used to support a supper club run by refugees, offer free meals made from surplus food, and as a pop-up cafe enabling a new catering enterprise run by women on very low incomes to trial things out before taking on their own space. We also teach cooking and low cost living skills as well as providing a safe and supportive space. Hornbeam Nights host music, educational film nights, supper clubs, environmental & social change workshops. We are always running on a shoe-string and we’ve decided to reach out in order to sustain our people-focused community events. Have a look at our events to see the various wonderful things happening all the time! So we’d love it if you could help us keep building our community with our latest community business idea! Every successful Hornbeam Night raises money for and builds our community further. But in order to continue our work we need some help to bring ourselves up-to-date with some better technology to help the events we organise inspire and enthuse. And we hope to see you at the Hornbeam sometime very soon! The Hornbeam are launching a crowdfunding campaign for our Hornbeam Nights in September at our JAM SANDWICH music//comedy//open mic night on Fri 22 Sept. If you’d like to be one of our FIRST supporters go to our Spacehive crowdfunder page! Hornbeam nights have not only become a great success but also built a wonderful community of creative folk. Alas, our equipment doesn’t reflect the quality of the creativity… We’d love the opportunity to spruce things up. WITH YOUR HELP: Our nights will be able to host top notch evenings with a large sway of activism & education, for a better community, environment & world. 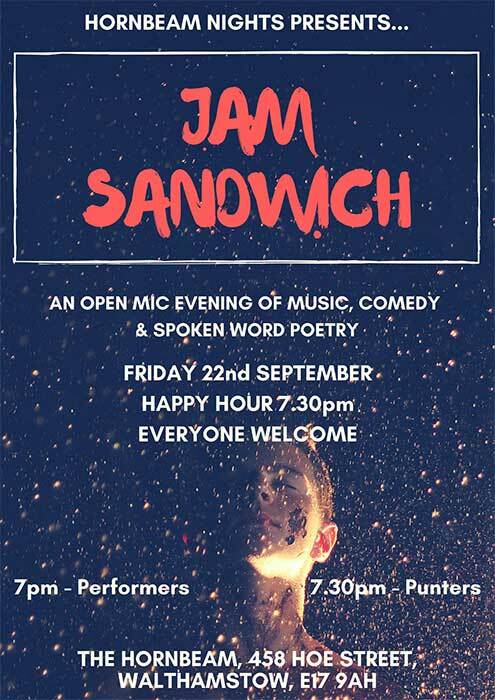 LAUNCH: We’ll be launching our campaign at our exciting new Open Mic evening Jam Sandwich on Friday 22nd September – the campaign will take place for six weeks. 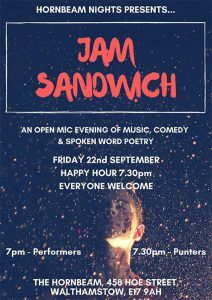 Jam Sandwich – music, comedy, poetry, spoken word – join us! TARGET: We hope to raise £5,000 to acquire sustainable sourced equipment: PA system, turntables, a mixer, a projector, projector screen, installation and setting up costs. Live music equipment. Furniture. Please keep supporting local talent, businesses and the community at The Hornbeam. Remember – it’s at Forest Recycling Project behind the Hornbeam this month – a big bright warehouse-esque space to hold more performers, punters and for any movers and shakers. Events, Fork to Fork, Hornbeam Nights, News from the kitchen! Join us for an exciting Japanese twist on our Saturday Pop-Up Supperclubs on Sat 27 May. On the menu is a vegan take on one of Japan’s most popular dishes, Ramen. Chef for the night is local resident Liam Emerson, with sous chef Bill Rae Smith. There will be two sittings, the first from 7pm til 8.30pm and the second from 9pm til 10.30pm, so pick one, book your place and come down and join us. The bar will also be serving a good selection of locally brewed beer and cider, plus soft drinks and of course tea!